Stiga Tennis Tables - T8508 Model Optimum 30 - Professional Series. 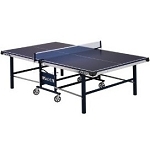 Get free shipping when ordering this table tennis table shipped to the lower 48 states. Get one of the best tables Stiga has to offer with the Optimum 30 from the Stiga Professional Series. 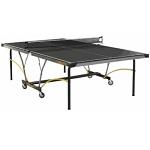 This table tennis table features a 30 mm thick table top and steel rectangular legs with levelers to provide your ping pong game the best ball bounce and rebound out there. The T8508 Stiga table also folds away for easy storage. Roll the table to the desired play and storage location on the 4 inch machine-grade casters. Order your Stiga Table Tennis Tables here. Table top play position dimensions: 108 inches L x 60 inches W x 30 inches H.
Table top solo playback dimensions: 60 inches W x 66 inches D x 62 inches H.
Table storage dimensions: 60 inches W x 24 inches D x 62 inches H.
Table top materials: premium composite wood particle board. Table top thickness: 1.2 inches. Uses Table Top Connect system. Top is specially treated to match an optimal friction coefficient so the ball bounces truer no matter the amount of spin on the ball. 2.4 inch steel apron for better table support. 2.4 inch x 1.6 inch steel legs with levelers. 4 inch machine-grade, Ball-bearing casters for easy movement of the tennis table. Strongest chassis construction of the Stiga table tennis table line. Semi Automatic lock and fold design. Includes Stiga VM net and post set (ITTF approved). Delivery for this product is a curbside delivery, meaning the customer will need to be present at the time of delivery, sign for the package, and help unload the product. Product shipping weight: 325 lbs. Product shipping dimensions: 64 inches x 57 inches x 8.7 inches. Comes with a 2-year warranty honored by Escalade Sports. Ships from the warehouse in San Diego, California. Recently purchased this table for my home; Box came shipped w/o damage and setup was easy... you can simply follow this youtube video for setting it up [ URL: https://www.youtube.com/watch?v=k_7l7XXMDvc ]; I actually did the setup by myself, thus if you need assistance to lift the table, youll need another as is demonstrated in the video. Overall excellent quality... the bounce is consistent, thus if your a tournament player youll love this table!!! A: Paddles are sold separately. Dimensions: 64" x 57" x 9"